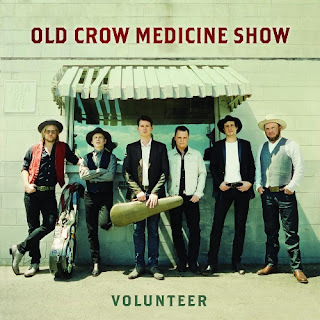 There will probably not be a more profound homage to the southern states among this year’s major releases than the new album by old roots favourites Old Crow Medicine Show. Starting with the evocative title and threading through a sound that signals the familiar with the odd twist, VOLUNTEER voluptuously feeds the desire for more of the same that fans have craved over the years. This record sees the band return to the fold of original material following a year of paying tribute to their hero Bob Dylan via the BLONDE ON BLONDE revival project. In essence, this is the follow up to the 2015 Grammy winning effort REMEDY and it will be no surprise if such acclaim comes knocking again. Before you even slide in the opening track, a glance at the song list reveals words such as ‘Mississippi’, ‘hickory’, ‘mountain’ and ‘Dixie’ suggesting a southern flavour is going to prevail. This is confirmed barely a couple of bars into the riotous fiddle-led hoedown number ‘Flicker & Shine’; a surefire sign that you are in Old Crow territory. This bout of frenetic mayhem is not alone as the two-minute fiddle feast instrumental ‘Elzicks Farewell’ lies in the penultimate slot alongside a ‘call and response’ back to basics piece titled ‘Shout Mountain Music’, anchoring deep in the core of the record. The latter is a celebration of riding into Nashville proclaiming the joy of rural music and succeeds in raising the roof in true Old Crow style. Yet amidst the familiar, there are subtle diversions. No doubt, these are heavily influenced by hooking up with prolific producer Dave Cobb. Yes, another project from him I hear you say. A little research reveals that this is the first time the band have used electric instrumentation since 2004. Such addition tastefully slips in and it supplements rather than knocking the trademark acoustic sound off its pedestal. The most recent promoted track epitomises the slight shift away from old time roots into a more progressive sphere.Here ‘Whirlwind’ closes the album with a romantic slice of contemporary country. Earlier, ‘Homecoming Party’ is an ironically titled gentle country roller, providing more than a nod to John Hartford’s ‘Gentle on My Mind’ in its melodic presence. Its sentiment is that coming off the road is often ‘no homecoming party’, as the subject struggles to settle back into mundane civilian life. Among the plethora of standout songs on the album are two heavily biased southern pieces in the first half of the record. ‘Child of the Mississippi’ is straight out of the Mark Twain school of character content, complete with trademark references to ‘muddy waters’, ‘steamboat’, ‘river man’, all enriched by familiar Old Crow banjo. Following this in the running order is the equally explicitly titled ‘Dixie Avenue’ celebrating the thirty-year music making partnership of the band’s two core players Ketch Secor and Critter Fuqua. This piece of nostalgia is home to some of the electric guitar, although the fiddle is never far away. ‘Old Hickory’ is another delve into southern lore as banjo returns to strum along to this story piece, successful in re-enacting the chorus friendly traits of the band’s music. Not quite the karaoke status of ‘Wagon Wheel’, but in that direction. Another catchy chorus exists in ‘A World Way’, a decent if not spectacular song that tones things down after the frantic opener. Anthem qualities reside in ‘Look Away’, another track where electric sits neatly alongside fiddle. This song is probably the nearest to a ballad on the album, in contrast to the boogie woogie vibes of ‘The Good Stuff’, which keeps the momentum going at the heart of the record. Overall, VOLUNTEER succeeds in a mission to resume the Old Crow Medicine Show legacy drive. It largely sticks to the familiar template, with any diversions skilfully factored in. Its evangelical tip to the South displays proudly, but ultimately it is a foot tapping delightful listen. A fine example of old time stringed music successfully brought to the masses, with the added spice of this one stretching a little further.